The LaserJet Pro 400 M401dw is a midrange printer that combines the latest technologies of HP in one compact package. The LaserJet Pro 400 M401dw black and white laser printer is aimed at home offices and small business looking for a reliable device that can print fast and has versatile connectivity options. However, the HP LaserJet Pro 400 Printer M401dw only prints in monochrome and the touchscreen display needs improvement. The HP LaserJet Pro M401dw mono laser printer appears similar to its non-Wi-Fi capable sibling with the protruding 3.5-inch display screen on top, the 800MHZ processor, and the 256MB memory. There are two standard paper trays on-board the LaserJet Pro M401dw and a 150-sheet output area. Connectivity is also possible via USB 2.0 and wired Ethernet. Two cartridges are available for the HP M401dw including the better value high capacity black HP LaserJet Pro M401dw toner which can print approximately 6,900 pages compared to the 2,700 page yield of the standard HP toner. Wi-Fi connectivity is supported by the HP M401dw LaserJet Pro printer, which is convenient for remote communication with the device. It prints reasonably fast at up to 33ppm. The HP LaserJet Pro 400 M401dw laser printer includes an automatic duplexer and sheetfed document finishing options. Paper handling is quite versatile from plain to speciality paper like cardstock, transparencies, and labels. Users can integrate an optional 500-sheet input tray for bulk printing needs. 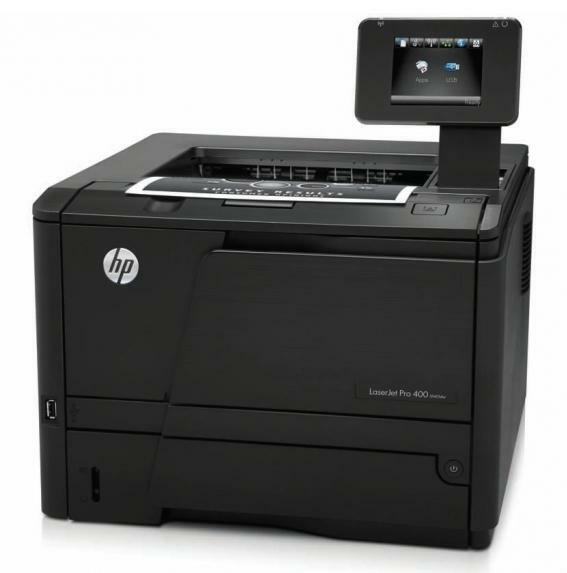 The HP 400 M401dw LaserJet printer supports mobile printing like Apple AirPrint and HP ePrint. The touchscreen display is flimsily designed and can be awkward to use. Only Windows operating systems are supported by the HP Smart Install. There are no options to expand the built-in memory of the HP LaserJet Pro M401dw. The device is also criticised for its high initial cost.